"My sister got this recipe from a restaurant in Ohio and all our family loves it. 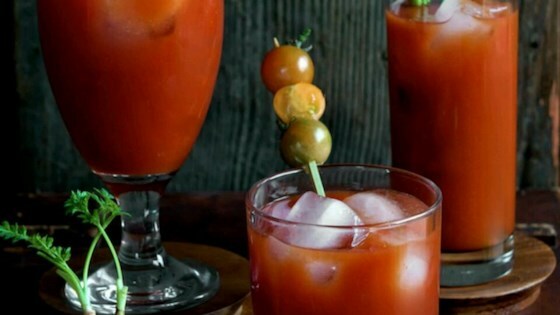 This is very spicy and needs time to blend flavors." In a large pitcher, combine juice cocktail, lemon juice and brown sugar. Season with Worcestershire sauce, horseradish, hot sauce and celery salt. Cover, and refrigerate 8 to 12 hours to allow flavors to meld. This was very different. It was a decent mixed drink, but tasted nothing like a Bloody Mary should taste. Made this yesterday for the 4th of July and it was really very good. I used lime instead of lemon and it was great! I left the hot pepper sauce out so people could add more if needed. Very nice. This was sooo good. I didn't change the recipe at all. It got better the longer you waited. Yummy!! This is great and so easy! I have given this recipie to several of my Friends and they love it. Great for a Sunday Brunch.